The first President of the Republic of Indonesia, Sukarno, who was called Bung Karno, born in Surabaya, East Java, June 6, 1901 and died in Jakarta on June 21, 1970. His father named Raden Soekemi Sosrodihardjo and his mother Ida Ayu Nyoman Rai. During his life, he has three wives and blessed with eight children. Fatmawati wife have children from Guntur, Megawati, Rachmawati, Sukmawati and thunder.Wife of Hartini have Typhoon and Bayu, while the wife Ratna Sari Dewi, derivative Japanese woman named native Naoko Nemoto have children Kartika. Sukarno's childhood just a few years living with his parents in Blitar. Durante la escuela primaria hasta la graduación, vivió en Surabaya, un huésped en la casa de Haji Oemar Said Tokroaminoto, fundador veterano político de los Estados islámicos. A continuación, volver a la escuela en HBS (Escuela de Burger Hoogere). While studying at HBS, Sukarno had galvanizing spirit of nationalism. After graduating HBS in 1920, moved to Bandung and continue to THS (Technische Hoogeschool or Technical High School which is now the IT.Ia won the title "Ir" on May 25, 1926. Then, he formulated the doctrine Marhaenisme and founded the PNI (Indonesian National Party) on July 4, 1927, with the goal of an independent Indonesia. As a result, the Netherlands, put her in jail Sukamiskin, Bandung on December 29, 1929. Eight months later a new trial. In his defense entitled Indonesia Sues, he showed apostasy Netherlands, a nation that claimed more advanced it. The defense made the Netherlands more and more angry. So in July 1930, PNI was dissolved. After being released in 1931, Sukarno joined Partindo and simultaneously lead. As a result, he was re-arrested by the Dutch and exiled to Ende, Flores, 1933. Four years later moved to Bengkulu. After a long struggle, Bung Karno and Bung Hatta proclaimed Indonesia's independence on 17 August 1945. In BPUPKI June 1, 1945, Ir.Soekarno basic idea of the state which he called Pancasila. August 17, 1945, Ir Soekarno and Drs. 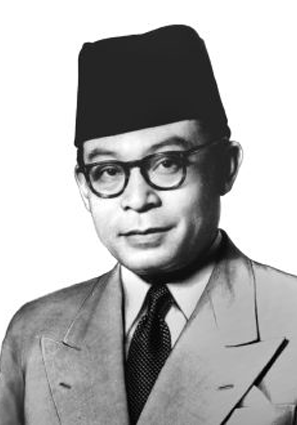 Mohammad Hatta proclaimed Indonesian independence. In the trial PPKI, August 18th, 1945 Ir.Soekarno elected by acclamation as the first President of the Republic of Indonesia. Previously, he also succeeded in formulating Pancasila which later became the basis (ideology) of the Unitary Republic of Indonesia. He seeks to unite the archipelago. Even Sukarno tried to gather the nations in Asia, Africa and Latin America to the Asian-African Conference in Bandung in 1955, which later evolved into the Movement of Non Blok.Pemberontakan G-30-S / PKI spawned great political crisis that led to rejection of the Assembly on accountability. Instead the Assembly appointed Soeharto as Acting President. His health continued to deteriorate, which on Sunday, June 21, 1970 he died in the army hospital. He was buried at Wisma Yaso, Jakarta and was buried in Blitar, East Java, near the tomb of his mother, Ida Ayu Nyoman Rai. The government bestowed him as a "hero Proclamation". Mohammad Hatta, Indonesia es un héroe. Nació en Londres el 12 de agosto de 1902. En beliua nacimiento llamado Mohammad Ahtar y se llama Atta. Su padre era Mohammad Jamil y su madre era Siti Saleha entre los comerciantes. En poco tiempo, tapón Hatta escuela primaria en Londres, que fue tomada originalmente en privado. Después de que se fue a ELS (Europeesche Lagere School), Padang. Grados 5 a 7 tapón Hatta kilometraje MULO (Meer Iutgebreid Lager Inderwijs) hasta 1917. Bung Hatta was very active in carrying out his duties as treasurer in a youth gathering at Padang Sumatra. Named, Jong Sumatranen Bond. But, besides active in the movement area, he also thought of the suffering of the people due to the occupation. He has been taking science at Hogeschool Handles and Economische Hogeschool in Rotredam, Netherlands. There, he has particularly so many friends. In 1926 Bung Hatta was elected chairman of the Vereniging Indoneschie (political organization) until 1930. Bung Hatta very mementingka independence of Indonesia, with the introduction of Indonesia's struggle in Europe. In 1926, he represented Indonesia's International Democratic Congress in France. At that time, he managed to convince Congress to use the word "Indonesia" and not "the Indies". In Belgium, he explained the circumstances of the Indonesian people as a result of the Netherlands. In his struggle, Bung Hatta once exiled to Digul and Banda Neira. After the Pacific War broke out, he returned to Java. Dutch East Indies government-broke, and Japan will be in power. Indonesia under Japanese rule was also treated arbitrarily. Bung Hatta read a speech about the ideals of the independence of Indonesia in the field Ikada (Monas) on December 8, 1942. Japan raised the Bung Hatta and three other national figures to lead Potera (Pusat Tenaga Rakyat) established by the Japanese. He is also a member and vice-chairman BPUPKI PPKI are both formed by the Japanese in preparation for Indonesia's independence. On August 17, 1945 along Soekarno Hatta read the text of the proclamation of independence of Indonesia in East Pegangsaan 56. Siti Rahmiati is the wife of Bung Hatta, yangdinikahi on 18 November 1945 and obtained three children. Round table conference, the Indonesian delegation headed by Bung Hatta and held in The Hague in 1949. 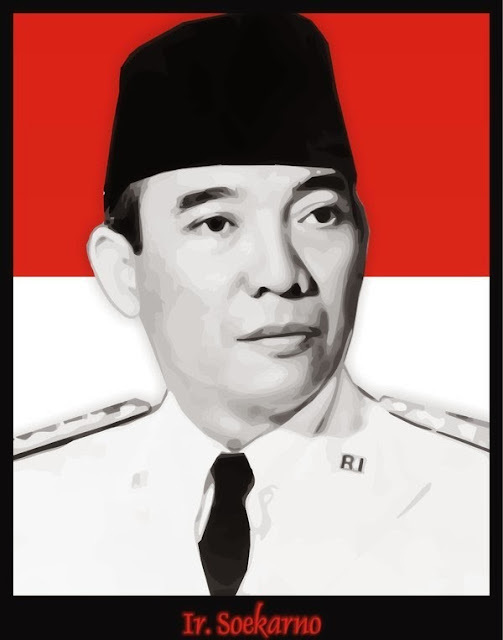 He was prime minister at first, but since 1950 he was the first vice president of the Unitary Republic of Indonesia. He is also very active attention to cooperatives, so that gradually the cooperative grow. Mr. Hatta was appointed as the National Cooperative. On August 15, 1972 Bung Hatta received the Star of the Republic Indonesia Class I at the Presidential Palace. He died on Friday, March 14, 1980 due to illness. 0 Response to "Biografi Ir. Soekarno And Moh. Hatta As Its First President Indonesia"